Paul J. Meyer adopted these words of the great theologian John Wesley for his own and lived them fully. 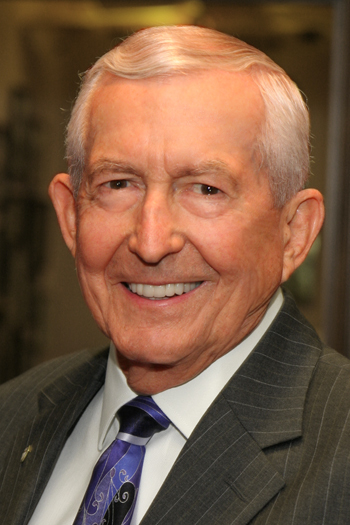 Paul, 81, longtime Waco civic leader, international businessman, philanthropist, loving husband, father, grandfather, and friend to legions of people worldwide, went to be with his Lord and Savior on Oct. 26, 2009, at home surrounded in love by his family. Paul's life will be celebrated at a memorial service 10 a.m. Friday, Oct. 30, at the Paul J. Meyer Arena, at the Baylor University Ferrell Center, with the Rev. Bill Hinson and the Rev. Mike Toby officiating. Immediately following the service there will be visitation with the family at the Ferrell Center. Paul was born May 21, 1928, in San Mateo, Calif. He was the son of the late August Carl and Isabelle Rutherford Meyer. His father was a first generation immigrant from Germany and master craftsman who instilled in Paul a standard of excellence in everything he did. Paul's mother, of Scottish descent, was trained as a teacher and a nurse who nurtured his desire to learn, to teach others, and to practice the principles of good health. Paul took great pride in passing these time-honored values to his children and grandchildren. Commitment and exuberance for success in his hobbies matched those Paul exhibited in his business life. He enjoyed flying his yellow Piper Cub airplane, snow skiing, cycling, scuba diving, tennis, and hiking. His varied interests and hobbies also included photography and antique cars, especially 1936 Ford Cabriolets. Paul loved Scriptures; he lived by them daily, and he shared them frequently with family and friends. One of his favorites was Luke 6:38: Give, and gifts will be given to you; a good measure, pressed down, shaken together, and running over will be put into your hands. For with the same measure that you use, it will be measured back to you. (Paul's paraphrase) Until the day of his departure from this life, Paul was witnessing for Jesus Christ. He did indeed give "a good measure" of "gifts" to his family, his friends, and to more than 30 important charities, including Mission Waco, Friends for Life, Lead Like Jesus Ministry, Compassion Ministries, Haggai Institute, and the First Baptist Church of Woodway. In addition to tangible gifts, Paul leaves behind many wonderful memories with family, friends, and business associates. Paul was preceded in death by his parents; sister, Elizabeth Meyer; and granddaughter, Allison Bucy. Paul is survived by his wife, Jane Gurley Meyer, and five children and their spouses, including the Honorable Jim Meyer and Carolyn of Waco, Larry Meyer and Lynn of Austin, Billy Meyer and Deborah of Waco, Janna Slechta and Randy of Waco, Leslie Rhea and Kevin of Waco; and brother, Carl Meyer and Joyce of Port Isabel. Paul's 15 grandchildren were a significant part of his life - Mike Meyer and wife, Nadine of Dallas, Brady Meyer of Dallas, Jessica Meyer of Austin, Jennifer Meyer of Chicago, Joshua Meyer of Austin, Adam Meyer and wife, Claire of Ft. Worth, Christie Johnson and husband, Barry of Waco, Morgan, Brooke, and Kelsey Slechta of Waco, Jordan, Jaden, and Ryan Rhea of Waco, Cole Bucy and wife Skye of Washington, D.C., and Jason Bucy of Los Angeles. Honorary pallbearers are Bill Armor, Steve Bright, Del Chesser, Gene Franklin, Ferrell Hunter, Terry Irwin, Joe Baxter, and Chuck Williams. Jane and the family wish to express their deep appreciation to all the doctors, nurses, and caregivers. These angels on earth helped Paul as he fought his battle with cancer. Memorials may be made to any of the ministries named above or any Waco charity of your choice.